Kyocafe chacha is a shop close to Kiyomizu Temple that specializes in waffles that look like lollipops! They make them at the shop every day, so as you can probably guess, the smell is divine. 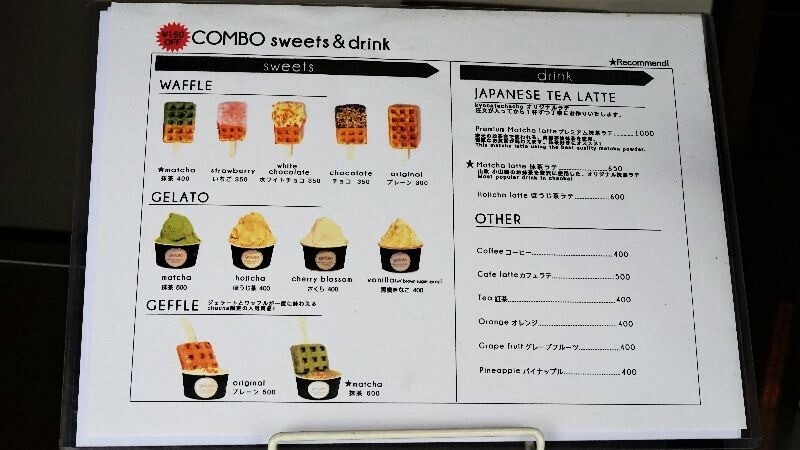 They have matcha, chocolate, and strawberry waffles available all through the year, the cute waffles awaiting you on their showcases neatly arranged, it’s no wonder they have become a hit among young Japanese women and tourists. As they’re just the right size to take out, many people buy them and then go take pictures by the beautiful temples and scenery of Kyoto. They also have ice cream waffles which are sure to satisfy you. Of course, they also have coffee, matcha latte, and seasonal products only available for a limited time, so afternoon tea here will be great. The shop is in a renovated machiya townhouse, it has two floors and seats 20, so after sightseeing, have a break at kyocafe chacha! *After eating check if the stick of your waffle lollipop has any writing on it; if you’re lucky, you can get another one! The waffles are chewy in a nice way and are sugar-coated, the texture is nice, and there’s something special about them. The buttery smell adds to the experience. The white chocolate, chocolate, strawberry, and matcha add to this taste and make the waffles even tastier. They look very cute and are great to eat while walking. Homemade gelato is topped with a waffle, so you can taste two different things, which are both sure to satisfy you. They use Yamamasa Koyamaen’s matcha powder in the waffle, and pour some also on the waffle and gelato, so you get to enjoy a full-on matcha experience with the bitterness and all. When you add matcha ice cream to this, you get a perfect matcha dessert. With the plain one, you get vanilla gelato, and the strong taste of the vanilla goes very well with the waffle. *You can change the gelato from vanilla. Only in autumn! The waffles with purple sweet potato and pumpkin paste on them look really cute. The fragrance of the sweet potato makes you feel like autumn. The pumpkin paste is thick and contains honey, and it’s full of flavor. It’s topped with pumpkin seeds and nuts, which add to the taste. As these look really great, they’re the perfect companion to your Instagrammable travels. The milk helps bring out the taste in the matcha, and the fragrance is almost as strong as in freshly ground matcha. After having a gulp, you’re hit by the slight bitterness of matcha right away. Because this drink doesn’t contain sugar you get to enjoy the authentic taste of matcha. Their menu is in English, and the waffles are in a showcase, so you can point at the one you want to have. 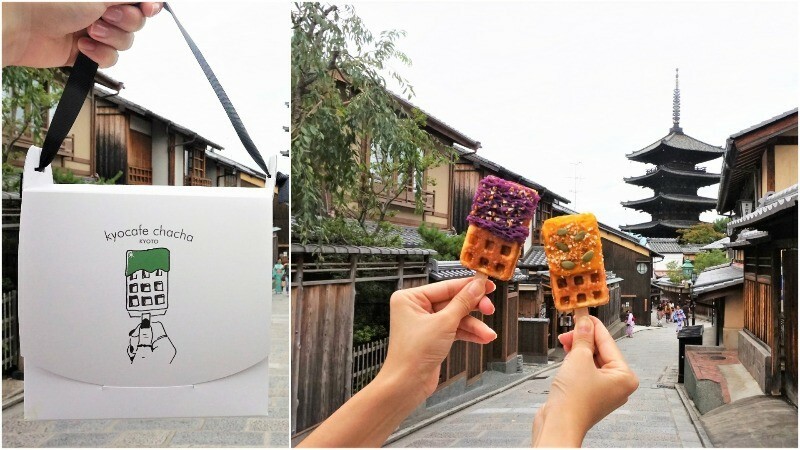 You can buy waffles to go and take pictures on the streets of Kyoto. The bag on the left size can fit four waffles, so you can share them with your friends while you walk to the sightseeing spots of this old capital city. *You can only fit normal waffles into the bag, as the coating on the seasonal ones may melt. The cute waffle lollipops are all the vogue on social media. They’re crisp, soft inside, and I really like them. I especially liked the matcha one, the bitterness in matcha made me feel as if I was drinking thick matcha. It’s close to Kiyomizu Temple, so get some to go and go take pictures! They’re sure to go viral on social media! This place is close to Kiyomizu Temple, but as it’s maybe the most or second famous sightseeing spot in Kyoto, there are many shops catering to tourists around here. Among those, kyocafe chacha is a bit more chic than most others. The Kyo-waffles are cute and colorful, and the shop itself has a modern, but in a traditional machiya, and the Japanese atmosphere is the best! The logo of kyocafe chacha, which you can see right after you enter the shop, is especially cute, so consider taking a photo in front of it to remember your visit! If you’re wearing a kimono, be sure to get a Kyo-waffle, and take pictures with it around the sightseeing spots around Kiyomizu Temple. You get cute and Instaliscious pictures! A 1-minute walk from Kyoto City Bus Gojozaka bus stop. A 10-minute walk from Keihan Kiyomizu-Gojo Station. Close to Kiyomizu Temple, menu in English.